I’ve been scratching my head about French secularism, which is several shades more secular than American secularism. 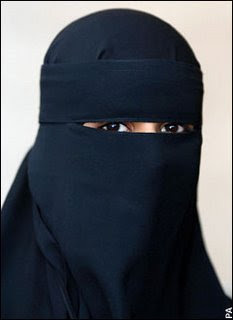 A woman in France was recently denied citizenship because she was veiled from head to toe during her application interview, and for no other reason. She lives in France, speaks French fluently, and is married to a French citizen, with whom she has four little citoyens. France takes this sort of approach not just to outsiders, but to citizens as well. A 2004 law banned the wearing of religious symbols, including Islamic veils, yarmulkes, and large Christian crosses, in government-funded schools. This degree of intrusion into people’s lives makes me very uneasy. I certainly want the right to live my life in accordance with my own thinking…at least as long as I am harming no one. I want to be able to speak out (in words and symbols), instead of keeping my ideas in the dark recesses of my own mind. The best argument I’ve heard to defend French extreme secularism (“laicite,” as they call it) is that the government is saving women from being coerced by brothers, fathers, and clerics who think they know what’s best for them. But that argument makes me nervous. When someone wants to speak out in an unorthodox way, or live in an unusual way, it’s very often possible to question how free they really are. You can often wonder whether there’s coercion coming from family and friends, whether their choices are really free. Then there’s the argument that Muslim veiling is divisive and the ban in schools is necessary to avoid violence, but this just doesn’t really compute. If I were a Muslim living in a society where I was told what to wear, it would make me furious. If I were the husband, or brother, or friend of the woman denied citizenship just because of her veil, my feelings for French society and its aggressive secularism would not be warm. But I also tell myself to get a grip and recognize that this is her choice. Yes, yes, it may not be a pure expression of “free will” but it’s very hard to say which choices are and which aren’t. It may even be at the most iffy end of the spectrum. I’d be happy to see people persuade her out of it (Muslim women especially—because they are bound to have much more “cred” with her) but I’m proud of the American civil liberties tradition that keeps government at bay.